A steering wheel that is hard to turn is a serious problem. It can impact your ability to maneuver your car as and when required and therefore is a safety risk for you and other drivers on the road. For this reason, it is important to have your steering checked by a professional car technician as soon as possible. A fault with the power steering system is one of the most common factors behind a steering wheel that is hard to turn. The power steering fluid helps in generating the required pressure against the wheel enabling the wheels to turn. If this system works fine, you will not face issues of hard steering. 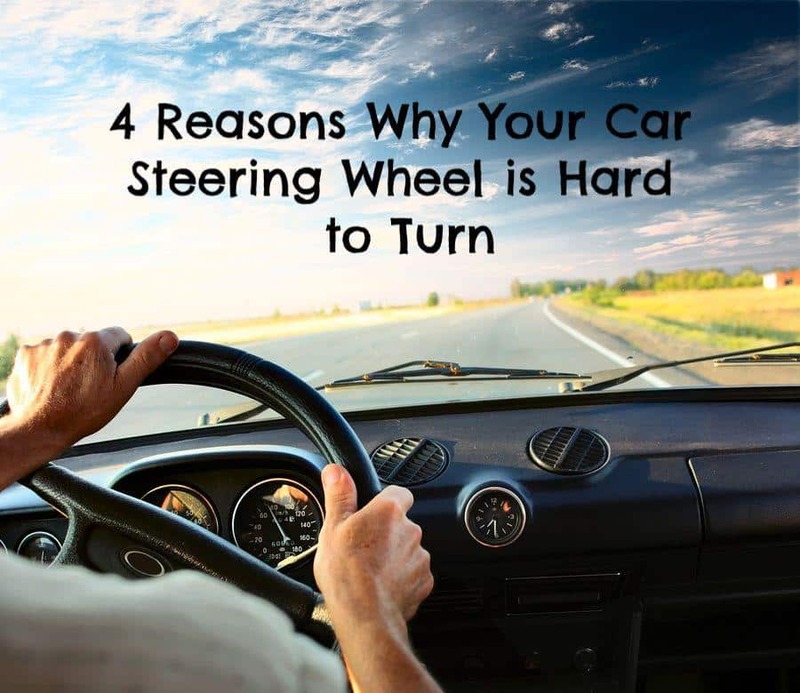 The problem of hard steering manifests itself when the power steering system develops a fault which could be due to any one of the following four reasons. The force which enables the power steering system to function is generated from the power steering fluid which applies pressure against the piston inside the pinion and the rack. If this fluid level drops, the force that it exerts against the piston drops – this causes the steering to lose the support it gets from the power steering system. When this happens, you will find that the steering is hard to turn. If the power steering belt is damaged, the power steering system gets affected which in turn impacts the steering. All parts of any mechanical device can get damaged due to factors such as heat, friction, and pressure. Over a period of time, this can lead to damage from wear and tear. The power steering belt is no different – it can get damaged and either loosen or simply snap. If the power steering belt snaps or loosens, the functionality of the power steering system is reduced or completely diminished thus making the steering hard to turn. The steering rack is a part of the rack and pinion and a crucial component of the steering assembly. -If the steering rack gets damaged due to wear and tear it most certainly will affect the overall functionality of the steering system. -It is important to note here that if you find your steering is hard the first time and the issue resolves itself once you start driving, the problem is most likely because of a damaged steering rack. -If this is the case, you will find that once the car starts moving and it heats up sufficiently, the rack heats up and gets lubricated and the steering will turn and function normally. If the pressure in your car tires is low, then again you will find that your steering is hard to turn, or it feels heavy. -If either one or more of your tires does not have the needed pressure, the ability of the power steering system is impacted. -Remember, the power steering system generates force against the wheels which allow for easy steering. -Which is why it is important to check the tire pressure at least once a month and ensure that the tire pressure meets the recommended PSI level. -Another factor which contributes to hard steering is uneven tire wear. In addition to your car veering to one side and wheel misalignment issues, uneven tire wear can also lead to a hard steering problem. If you are facing any kind of steering issues including a steering that is hard to turn, get your car checked by a professional car technician because you don’t want to cause a wreck and you don’t want to be stranded on the side of the road during a Tucson summer. Your car technician will do a thorough check up to identify if the issue is due to a snapped steering wheel belt or low power steering fluid, of if there is damage to the steering rack. The first two issues are fairly easy to address – a damaged rack, however, can be a slightly complex repair job. Once the necessary repairs are done, the power steering fluid will be flushed, and the system will be checked and tested to ensure your car is good to go. Is your car steering hard to turn? Or even if you have any other issues with your car steering, we can help. Give Accurate Service a call today at 520-620-9129 or schedule an appointment online as per your convenience!